Murmurs of a potential PC port of 2018's Switch darling Octopath Traveler kicked into high gear last week when a Korean ratings board listed the title for PC. Today, Square Enix seemed to be ready to officially reveal the release, posting a newsletter to their website, but have since deleted the post. In case you missed it, Octopath Traveler is also getting an independent mobile adaptation as well with Octopath Traveler: Champions of the Continent. Luckily, nothing on the internet is gone forever, and here is the (currently deleted) blog post for the incoming PC version, as captured by Gematsu. It looks like PC gamers won't have long to wait for the somewhat surprising port, as its less than two months away, slated for June 7. We will update once all of the information about the PC release is made officially official. Our original review of the game can be found here. We have some very exciting news for PC gamers. Octopath Traveler is coming to Steam on June 7, 2019! So, yknow, add it to your Wishlist now. The critically-acclaimed RPG has previously only been available on Nintendo Switch, so this will be the first time non-Nintendo owners can experience the game. What is Octopath Traveler about? Olberic: an experienced knight in search of redemption. Cyrus: a scholar whose book smarts don’t always equate to common sense. Tressa: an enthusiastic merchant who is travelling the world to hone her skills. Ophelia: a noble cleric on a pilgrimage to Orsterra’s holy sites. Primrose: a fallen noble on a quest to avenge her murdered father. Alfyn: a naive apothecary determined to help people whatever the cost. Therion: a skilled thief trapped in an impossible situation. H’annit: an expert hunter, tracking down her missing master. You can start the game with any of those characters, and build your party in any order you want. Each one has a distinct class, and unique ‘Path Actions’ – abilities they can use out of combat to progress their adventure. For example, Therion can steal items from NPCs, Olberic can start a scrap with pretty much anyone, and H’annit can tame wild beasts. Over the course of the party’s various adventures, you’ll explore 8 vast regions full of stories, side-quests to discover, and gruesome creatures to battle against. 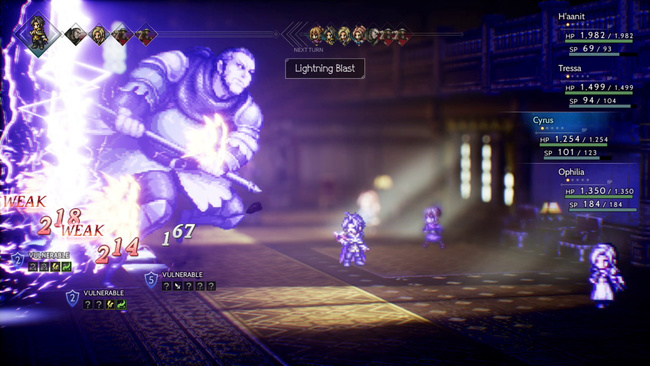 Speaking of battles, Octopath Traveler has a battle system that’s easy to understand, but imbued with impressive tactical depth. It’s based around ‘breaking’ your targets – every enemy has a shield, and you need to take advantage of their weaknesses to break it and put them into a vulnerable state which essentially stuns them for a turn. Finally, it would be remiss not to comment on how it looks. Octopath Traveler combines realistic 3D environments with classic RPG-inspired character sprites. It’s an utterly distinctive visual style and absolutely stunning – especially in motion. 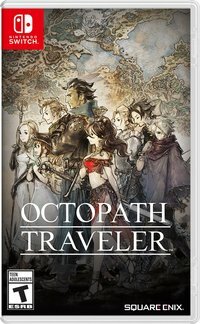 How do I get Octopath Traveler on PC? Octopath Traveler will be available to buy from Steam and the Square Enix Store. Add it to your Wishlist now!